Step 2 Sew around the velcro in a box shape. sewing as close to the edge of the velcro as you can but making sure you catch it all! Step 3 Sew the top edges together by placing the fabrics right sides together. The fabric that will be on the outside of the bag (not the lining) to have the velcro side to the top. The lining has its velcro to the other end. Sew a seam with a 0.5 seam allowance across this top raw edge. Step 4 Open up the seam so both fabrics are on opposite sides of each other. With right sides together, fold up each fabric side 22cm to meet the seam leaving the overlay at the top (there is a flap overlay at the top and that’s correct!). Pin down the side edges and sew with a small 0.5 seam allowance. Step 5 Sew up the top box now, again with right sides together and leaving a small gap 3 – 4 cm close to the original seam. Step 6 Turn the whole piece through using the small gap and press it all nice and flat. Push the lining inside the outer fabric. VIOLA! you are done, now you can size this up or down to suit your phone and devices! 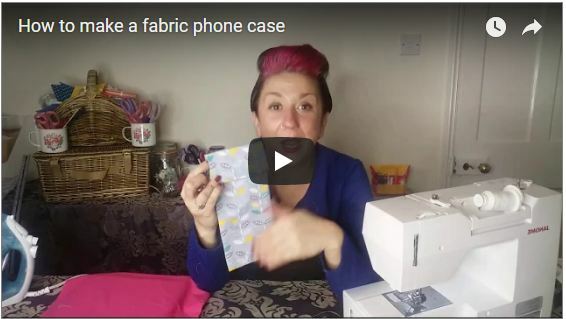 Next post: What’s your BIG SEWING QUESTION?